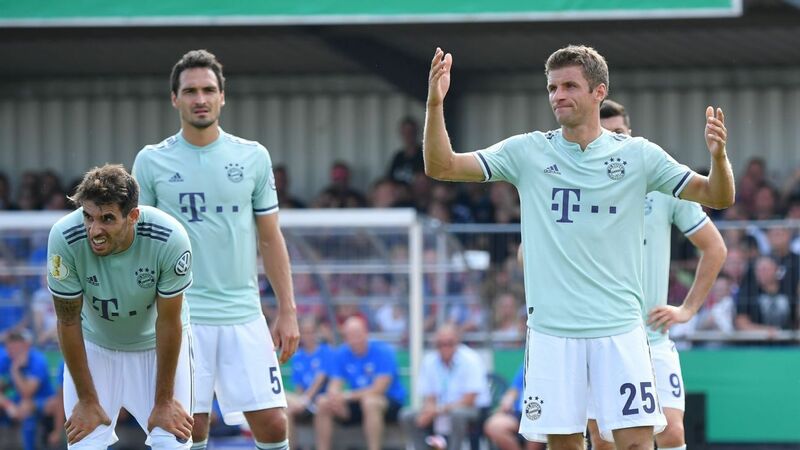 Bayern Munich were embarrassed by fourth-tier Drochtersen/Assel as they only managed a 1-0 win in the German Cup on Saturday. Bayern, who have won six straight Bundesliga crowns, went into the match against the village team (who have a population of 11,500) as heavy favourites under new head coach Niko Kovac. The starting XI for Bayern was virtually full strength and included the likes of Robert Lewandowski, Mats Hummels, Franck Ribery and Arjen Robben. But, despite having the lion’s share of possession, Bayern failed to break through in the first half and it was the Regionalliga Nord side that had the best chance as Manuel Neuer was forced into a fine save from Florian Nagel. At half-time, Kovac brought on Kingsley Coman and Leon Goretzka for Robben and Hummels to boost the attack. But Drochtersen/Assel put all their players behind the ball and bravely held firm. The match was halted for over five minutes when Bayern Munich fans threw toilet paper and beach balls onto the pitch. But Bayern got the winner in the final 10 minutes as Ribery broke free down the left and squared for Lewandowski to poke home off Goretzka’s low shot. Corentin Tolisso blasted over in the final minute from the penalty area, but Drochtersen/Assel will be proud of their performance despite defeat.